This pink number with statement ruffles and a matching hat. A glittering gold anarkali-style piece. Whoever said you can’t wear black to a wedding! Love this minimal black-and-metallic lehenga. A contemporary cape-style lehenga in dual pink shades. 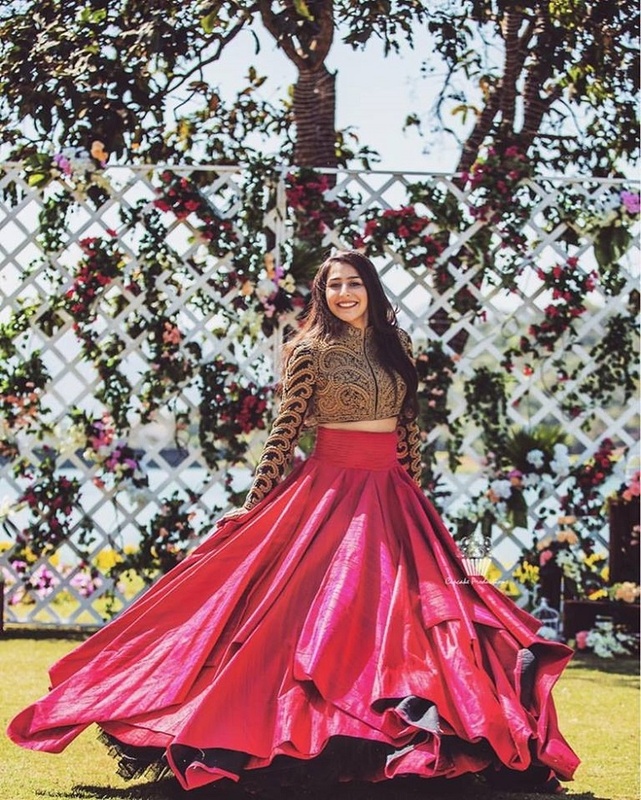 This fit-and-flare mermaid-style pink lehenga paired with a silver, off-shoulder, fringed blouse. This boss-bride jacket-blouse and fuchsia pink lehenga by Shantanu and Nikhil. This contemporary combination of a lehenga, saree and gown is too beautiful! Not a lehenga, but we love this bride’s relaxed Sangeet look in silk dhoti pants and an embroidered top!